A riveting memoir and a fascinating investigation of the history, uses, and controversies behind lithium, an essential medication for millions of people struggling with bipolar disorder. It began in Los Angeles in 1993, when Jaime Lowe was just sixteen. She stopped sleeping and eating, and began to hallucinate--demonically cackling Muppets, faces lurking in windows, Michael Jackson delivering messages from the Neverland Underground. Lowe wrote manifestos and math equations in her diary, and drew infographics on her bedroom wall. Eventually, hospitalized and diagnosed as bipolar, she was prescribed a medication that came in the form of three pink pills--lithium. 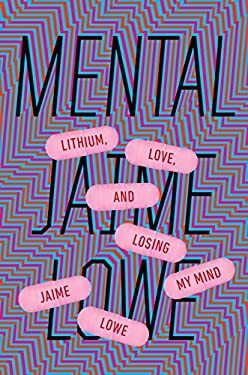 In Mental , Lowe shares and investigates her story of episodic madness, as well as the stability she found while on lithium. She interviews scientists, psychiatrists, and patients to examine how effective lithium really is and how its side effects can be dangerous for long-term users--including Lowe, who after twenty years on the medication suffers from severe kidney damage. Mental is eye-opening and powerful, tackling an illness and drug that has touched millions of lives and yet remains shrouded in social stigma. Now, while she adjusts to a new drug, her pursuit of a stable life continues as does her curiosity about the history and science of the mysterious element that shaped the way she sees the world and allowed her decades of sanity. Lowe travels to the Bolivian salt flats that hold more than half of the world's lithium reserves, rural America where lithium is mined for batteries, and tolithium spas that are still touted as a tonic to cure all ills. With unflinching honesty and humor, Lowe allows a clear-eyed view into her life, and an arresting inquiry into one of mankind's oldest medical mysteries.